I’m a gamer. In fact games were one of the main things that got me interested in computers in the first place. The games ran on computers, and the better and faster my computer ran the better my gaming experience was. So I learned about computers and how they work so that I could make my system run better. And while I’ve departed from this career path [long story] I’m still a gamer at heart and think I always will be. So I was excited when I came across this ‘Gamer Motivation Survey’ somewhat based on the MBTI. Below are my results. The two biggest are Action and Social. 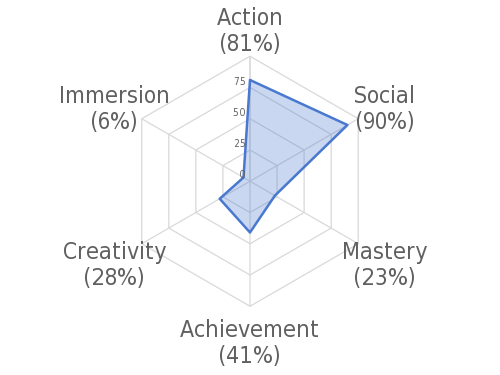 Action means a tendency to enjoy games that are fast paced and let me blow things up and just cause general mayhem and destruction. Social means games that let you play either against or with other players. I usually don’t pay much attention to story lines or character back stories. My full profile is here. This seems to be quite accurate to me based on my experience with games. The two games I have enjoyed the most are World of Warcraft [WoW] and Halo. Halo is a shooter and the action is fast paced and the later titles in the series allowed for online play either with or against other players. WoW is slower paced when compared with Halo, but when playing against other players the pace is quite fast and requires quick reaction times to succeed. Perhaps not surprisingly I greatly enjoyed playing a scorch mage during my trek to High Warlord in vanilla WoW, a spec which allowed me to blow people up very quickly and required quick reactions to play well. The idea in this song I think is pretty obvious so I won’t elaborate on it much. Basically it’s the idea that as a society we have become slaves to whatever corporations and various media outlets tell us is right. We have bought into their ideas as to what constitutes a fulfilled and do what they tell us to do in order to be happy. Lyrics are below the video. Theology is taking a break this week, so that it’s for now. This entry was posted in Uncategorized on July 28, 2015 by SRQTom. I love theology. In fact I love it so much I have a blog where I write about it. It’s really the foundation and framework of my life. Everything either grows from it or gets evaluated by it. I also love computers and technology. In fact I have an associate and a bachelor’s degree in this area. I also like music and find that some songs have good things to say. Unfortunately these last two areas rarely make it into my blog posts. So I’ve decided to start doing a weekly(ish) feature sharing some interesting things from those areas. The biggest issues for me are the lack of awareness about the feature, and how they are going to restrict the network access to strictly the Internet. This song brings up some interesting ideas for me. It talks about the dangers of seeking something ‘real’ in a digital world. In such a world nothing ages or dies. It can seem tempting at first, but such a world fails to satisfy us because it isn’t real. In reality we do age and we do die and such a world simply avoids these realities and provides no answer to them. The song calls to start a revolution against such a world. This, in my mind, is a good thing to do, but for me it brings up the question, ‘On what basis will such a revolution be grounded ?’ Christianity provides such a basis, but unfortunately this solution seems to have already been rejected by the larger culture. Here is the song w/ lyrics posted underneath. I appreciate this blog very much. The author spends much of his time countering modernist thought with classical Christian answers. This post deals with the issue of gender and its basic point is that we exist as male and female and we cannot exist any other way. He, of course, goes into much more depth on the issue. This entry was posted in Weekly Picks on July 4, 2015 by SRQTom.